Enrolling a daughter or son in hockey now costs more than joining the horsey set. Generally speaking, equestrian conjures up more elitist connotations than Canada's national sport. The stereotype doesn't hold up when the costs are counted. The Toronto-based Solutions Research Group released its Canadian Youth Sports Report on Tuesday, and found that hockey was the second-most expensive of the 44 that have sufficient participation numbers to be included in the study. 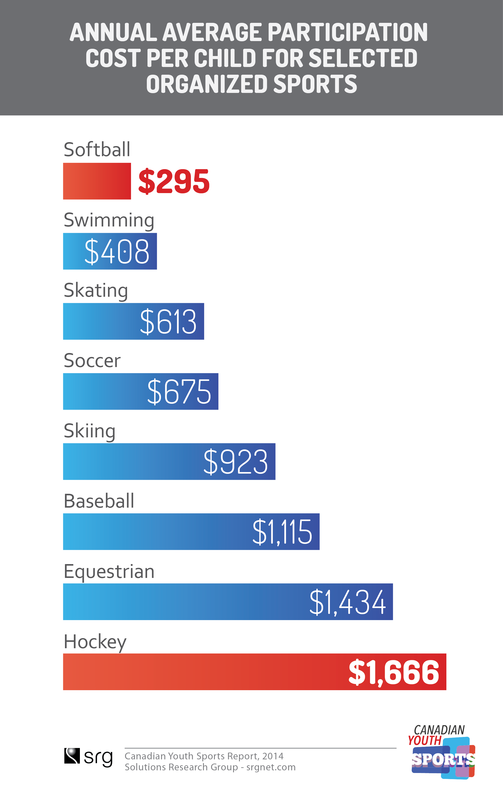 Based on average cost (keeping in mind that using the mean instead of the median skews the results), minor hockey costs more than softball, swimming and skiing combined. This probably isn't a newsflash to many Canadian parents or to anyone who's wondered what pricing out many families from competitive hockey will mean for the sport's future. Seeing the cold, hard numbers really brings it home: it's not for nothing that putting a child in hockey long term can feel as onerous as owning a boat; the only youth sport that's more costly is water skiing. 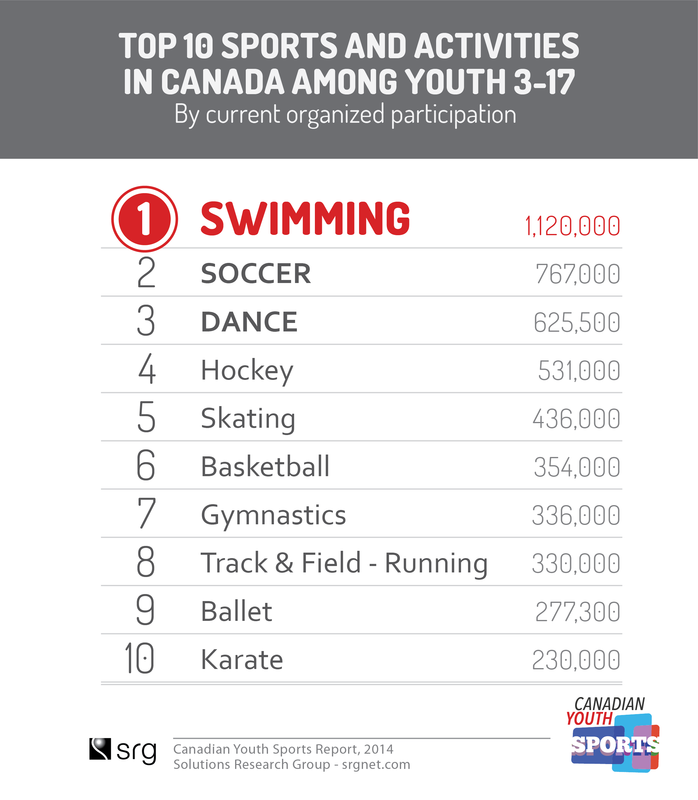 — Hockey is fourth in current organizated participation at 531,000, trailing swimming (1.12 million), soccer (767,000) and dance (625,500). — Thirty-two per cent of Canadian children follow the NHL. The passion is still there, although 43% of teens age 13-17 "do not follow any professional league." — Soccer and basketball outrank hockey in popularity among new Canadian youth (those from families where the parents were born outside the country). "With over one million immigrants settling in Canada every four years," the report states, "establishing a strong base among New Canadians is essential to the future growth of any sport in the country." — The puck game also faces an image problem. 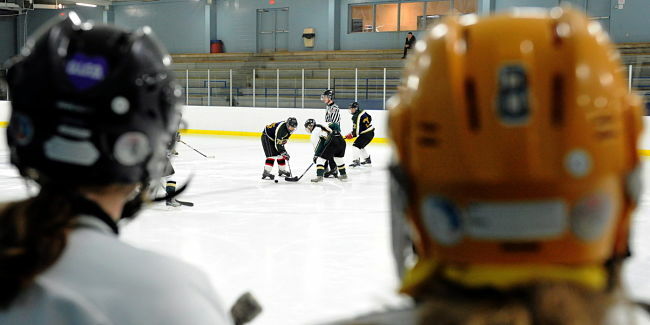 Parents perceive other sports as fun whereas, the authors write, "Hockey receives a mixed report card — on one hand it’s perceived as 'highly competitive' on the other hand parents say it's 'easy to be injured participating,' and that hockey 'has some pushy parents in kids leagues.' "
— Do bear in mind the cost to play in a recreational league is much, much lower than $1,666. The average is pulled up by the parents paying thousands per year to put a child on the myriad competitive teams. Still, that limits the size of the pool of those who can realistically aspire to compete in high-performance hockey. None of this will come to as any surprise to Hockey Canada and the myriad other gatekeepers. Virtually every change tried of late — banning body checking for peewee players, offering no-contact leagues or the option to play a season that lasts only three months instead of six — has tried to address declining participation numbers. Many initiatives driven by sponsors are also geared to trying to allay the costs of equipping and registering a child to play. I knew hockey was going to be a problem cost-wise when the league rep told me they have monthly payment plans available. Regardless, the report supports the narrative that hockey is at the head of the pack in a seismic shift in organized youth sports and other activities. It used to be looked at as a way to get exercise, learn and socialize with other children. Now it is an investment, starting right from the entry point when parents are mulling choices for little Aiden or Anna. Hockey didn't create that, it merely re flects that in a very extreme way. Either the sport can abide that race to the bottom or it can find a way to once again be a game that transcends class.